but then to have it featured by Temecula Wedding House was an added bonus for us. Colorful weddings are a fun surprise. A lot of brides stay in the neutral zone when they make their wedding plans and choose their wedding colors. This shoot, we called “Mother Nature”, was designed to show that color is also a viable option or choice. We think you will see how beautifully the design team pulled off that challenge. They used oranges, red, pinks and greens blended together for just the right pop of color. Many brides are avoiding the high cost of a wedding dress and are opting to wear a vintage wedding dress. Our model wore a vintage wedding dress purchased from The Cottage Charm in Murrieta. She pulled off the vintage 60’s styled dress perfectly. The empire waist and bell sleeves were all part of the charm of this alternative choice for a wedding dress. We just have to share the secret that the dress was under $40.00!! It just goes to show you there are ways to save money when planning a wedding. It fit her like a glove and she rocked it for sure! A bride and her dog. Flowers on a brides dog are a must. One of our favorite florists, Shawna from Bleudog Floral, who always rises to the occasion when we throw a project her way, out did herself once again. Her use of pink spray roses, orange ranunculus, lots of greenery and a touch of thistle made her creations look amazing! She even made a floral collar for the Brides dog, Kai. As always, Chateau Adare is a photographers dream location and Bleudog Fotography knows about all the secret spots to get the perfect photos. She had the Bride cuddle up to the horses on the property, even though they wanted to eat her floral crown. It was really a crack up! With all the animals, and flowers, and scenic backgrounds, it was such an organic feel and we all agreed the styled shoot should be called “Mother Nature”. Jennie from All Signs Point 2 Love was our cake genius. She made all the flowers on the cake out of gum paste, and seriously, they looked absolutely real. Vintage dishes, furniture, and vases were used for this wedding table. 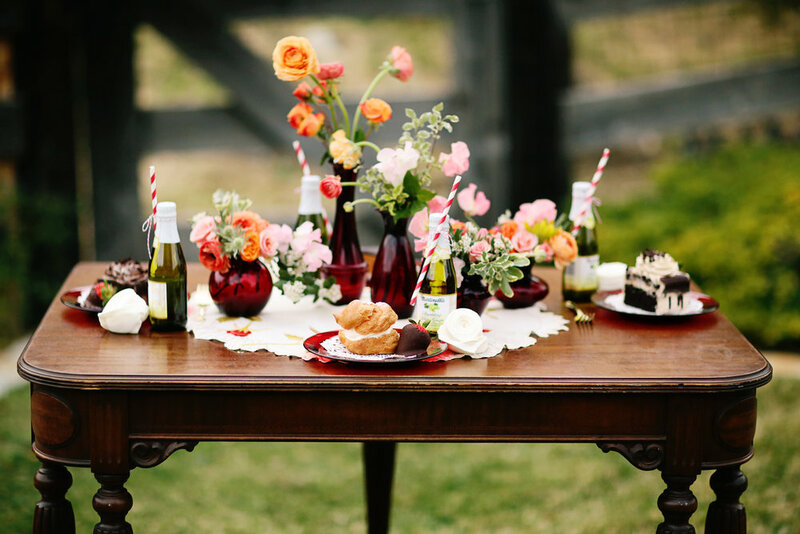 We used one of our favorite antique tables for the shoot and pulled in the vintage Anchor Hocking Ruby Glass accents. To compliment the vintage dress we simply HAD to feature the mismatched snack sets from the 60’s filled with all kinds of goodies. We also used the perfect little French chair we call Marie. The brides bouquet looked perfect on her velvet seat. Would you consider a colorful wedding? So future brides, we just have to ask, after seeing all this cuteness in living color, would you consider adding that pop of color to your wedding? Dare to be different.